St. Kevin's Church is a superb example of the Irish builders desire to integrate a circular bell-tower or belfry with a rectangular church. Perhaps because of its small size, or the tower's resemblence to a chimney, it is generally known as "St. Kevin's kitchen." The tower stands three stories high and is accessed from the upper croft chamber of the church roof. The four bell-storey windows face the cardinal points and the two windows in the storey below face east and west. It may be due to its small size, but this charming example of an integrated round tower is one of only two complete engaged towers to survive. 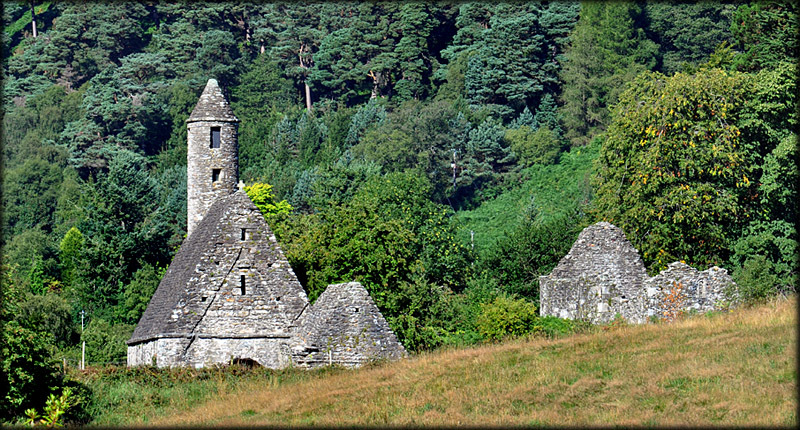 Trinity church at Glendalough also had an integrated tower. 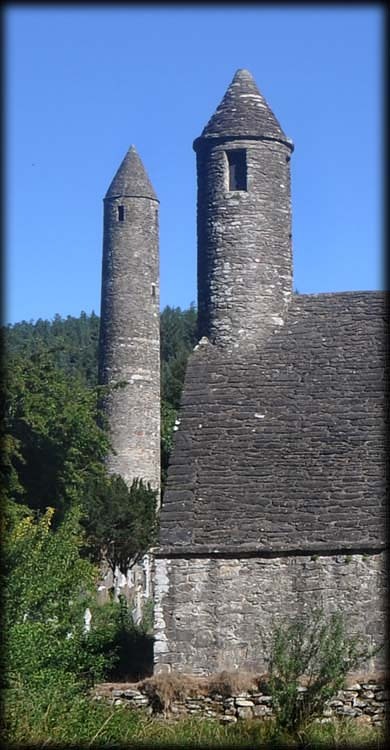 A superb example, though incomplete, is the tower in Ferns, County Wexford. The other complete engaged tower is Temple Finghin in Clonmacnoise. The upper part of the east gable window of the nave can be seen above what became the chancel arch, when the chancel (now missing) and the sacristy were added later. The steep roof has corbelled stones, similar to that at St.Doolagh’s Church in Dublin and St. Columb’s House in Kells. It is supported internally by a semi-circular vault. Situated: From Dublin there are various roads to Glendalough but probably the most direct route is to head south on the N11 to Ashford, then take a right turn sign posted for Glendalough passing through Annamoe and Laragh. Discovery Map 56: T 1225 9678. Last visit Sept 2013.